Here at DellPest we off most treating strategies offered in the industry today such as monitoring, liquid conventional treatment, and pre-treaments. DellPest currently have two products to choose from. These products are called Exterra by Ensystex and The Advance system by BASF. The principle for monitoring are all basically the same for both systems. What DellPest does is place stations around the perimeter of your structure at intervals of approximately 10 to 15 feet apart. Initially interceptors are put out (basically wood sticks) and they are inspected at scheduled times, mostly every quarter. 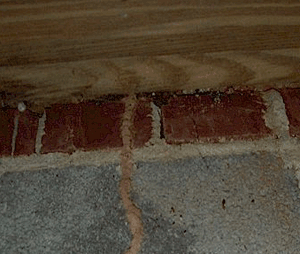 When termites are found during an inspection then the baiting process starts by applying an active ingredient that suppresses and sometimes eliminates the termite colonies. Click to learn more about the monitoring stations! The first step is to dig a 6" by 6" trench around the whole perimeter of the home that is accessible. In areas where concrete adjoins the perimeter, we bore one half inch holes every 12 inches to provide a uniform barrier. We apply a product per label instructions and state requirements to the perimeter of the home. If your home has a crawl space construction, we also trench along the whole inside and around all piers of your crawl space and apply the product. In slab constructions, we down drill holes along the interior expansion joints every 12 inches. If this can not be done because of obstacles in the home, we will attempt to do this by horizontally drilling from the outside to obtain access under the slab. 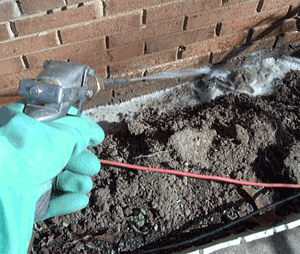 Our most used product would be a non-repellant termiticide such as Termidor. Pre-Treatments refer to the preventive treatment done on new construction. This could be for an addition done to your existing structure or a new structure all together. Ideally it is best to do it in the first phase right after the footing has been poured. The chemicals are applied at the rate of 1 gallon per 10 square feet and 4 gallons per 10 linear feet along walls and piers and in porches. The second phase would consist of treating slab additions such as garages right before the slab is poured. Then the final phase is done when all construction and the final grading is done. In that we return and make a 6 inch trench around the outside and apply at the label rate. Most county code enforcers require that pre-treatments be done and by law we are required to do it as the label states. Call us at (704)922-5500 for an estimate.